Yosemite changed the default behavior of the window zoom button (green circle) to bring the window full screen instead of resizing (zooming) to the content. You can of course hold down the option key on your keyboard when clicking the button to toggle between full screen and zoom. However, if you want to change the green button to always zoom again and not have to hold down option, you can accomplish this with a free app called BetterTouchTool. 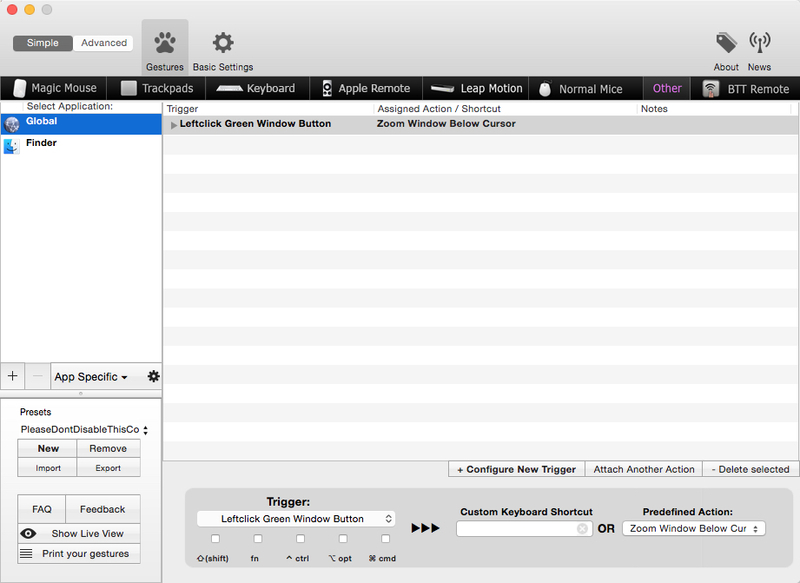 Once you have BetterTouchTool installed, go into Preferences and configure a new trigger. Make sure Global is highlighted in the left sidebar. Click the Configure New Trigger button. From the Predefined Action drop down select Zoom Window Below Cursor (this can be found under the Window Interaction section). From now on the green button will zoom to the content instead of going full screen. Prior to Yosemite, I had been using RightZoom to have the green button maximize the window to the full area of the screen similar to how the maximize button in Microsoft Windows works. As of now, RightZoom is not compatible with Yosemite. So instead I can setup BetterTouchTool to do the same thing. Instead of selecting Zoom Window Below Cursor, select Maximize Window. I also setup another trigger for Rightclick Green Window Button to Restore Old Window Size. And just in case I ever do want to go into full screen mode, I setup a third trigger for Leftclick Green Window Button plus the option key and select Enter Fullscreen. BetterTouchTool has many other features besides these, definitely worth checking out. Would be nice if this worked in El Capitan too. Works for me in El Cap. I’ll second that – it works in El Capitan for me too, same instructions as above.